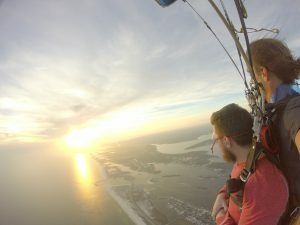 Sunset Skydiving & Beach Landings! 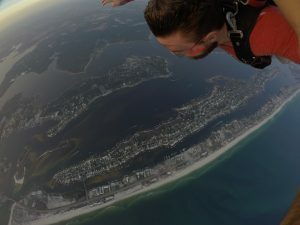 Skydive the Gulf is the only place in the world that offers a sunset skydive AND beach landing onto the world famous Flora-Bama Lounge and Beach Bar! Arrive in serious style at the Flora-Bama during a breath-taking and unforgettable Gulf sunset. Be sure to sign up for our video and pictures packages so that you can share this bucket list experience with your friends and family. When you arrive, your instructors will be ready to harness you up and board the plane. We strive to be a no-wait operation! The door opens, Freefall @ 120 MPH for 45 seconds! If 2 cars are available, stage 1 car at the Flora-Bama Lounge & Beach Bar and drive to the skydiving center a few miles away. 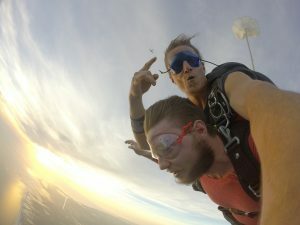 Safety is our number one concern and weather conditions are major in skydiving. Unjumpable conditions may include but are not limited to cloud cover, high winds, and/or precipitation. Your deposit is ABSOLUTELY REFUNDABLE in the case of weather. If you are on the island longer than one day we would love if you would reschedule with us. We are flexible and would hate for you to miss out on such an unforgettable experience. You must weigh 260 lbs or less to participate. These requirements are in place to ensure our #1 priority of safety. Students over 200 lbs. will be assessed a fee of $1/lb. We have a minimum two tandem students per flight. Customers may be assessed a fee for single student flights. Absolutely no alcohol and/or drugs in your system 24 hours before making a tandem skydive.